April Michelle Davis of Editorial Inspirations led the workshop “Working with an Editor: The Editing Process” at the Hanover Book Festival on August 10, 2013. 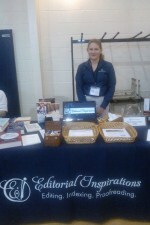 April Michelle designed the workshop with authors in mind, but professional editors also found it valuable. The workshop highlighted the editorial process, how to select an editor, and what can be expected from working with an experienced editor. The process of finding an editor can be intimidating, and finding an editor with the appropriate level of skill set can present an even bigger challenge. Stay tuned for future audio availability of an excerpt from the workshop. In addition to holding the workshop, April Michelle offered mini-conferences, where she critiqued the first 1,000 words of manuscripts and provided 10-minute consultations for authors. While at the book festival, April Michelle met over 40 authors who had booths at the event, plus many more people who stopped by her table. This entry was posted on Sunday, September 1st, 2013 at 12:00 pm and is filed under EI News. You can follow any responses to this entry through the RSS 2.0 feed. Responses are currently closed, but you can trackback from your own site.